US President Barack Obama delivered a nationally televised address on Thursday night, giving a preview of an executive order to be signed and made public on Friday. The program outlined by Obama would cover less than half of the 11-12 million undocumented immigrant workers and children now in the US, with the remainder subject to immediate detention and deportation as “illegals.” In its six years in office, the Obama administration has already deported more immigrants than any government in US history. Despite the howls of “amnesty” from sections of the Republican Party, and praise for the White House from its media backers and Democratic Party-affiliated Latino groups, Obama’s executive order is anything but a green light for immigrant workers seeking legal status, economic security and recognition of their human rights. As Obama explained in his speech, the bulk of the 5 million or so immigrants who qualify for non-deportation and work permits must have lived in the United States more than five years and have children who are American citizens or legal residents. They must register with Immigration and Customs Enforcement, part of the Department of Homeland Security (DHS), pass a criminal background check, and pay any back taxes. In return, they will “be able to stay temporarily,” Obama said. Obama’s speech was entirely within the right-wing framework of official American politics, in which workers who come to the United States fleeing poverty and dictatorship—for which American imperialism is principally responsible—and take the hardest and worst-paid jobs are demonized as criminals who must be “held accountable.” Meanwhile, the true criminal class in America, the financial aristocracy that controls both the Democratic and Republican parties, amasses untold and unearned wealth. Referring to immigrant workers, Obama said, “All of us take offense at anyone who reaps the rewards of living in America without taking on the responsibilities of living in America.” Who is he talking about? Who is reaping rewards without taking responsibility? Such terms apply with much greater justice to the parasitic ruling elite that Obama and the congressional Republicans and Democrats represent. These gentlemen were bailed out to the tune of trillions following the 2008 financial crash. But no banker or hedge fund mogul has had to repay these infusions of taxpayers’ money or been held accountable for the financial manipulations and fraud that wiped out the jobs and living standards of tens of millions of working people. 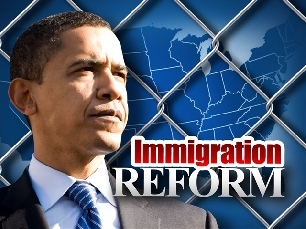 “Undocumented workers broke our immigration laws, and I believe that they must be held accountable,” Obama declared. The Obama administration has refused to apply this standard to bankers and speculators who broke laws against swindling, or CIA agents who broke laws against torture, or top officials of the Bush administration who waged illegal wars and lied to the American people. And, of course, the Obama administration itself operates outside the law, trampling on the US constitution in its assertion of unlimited presidential powers to spy on, arrest, detain and even assassinate American citizens. Under the Obama plan, the majority of workers who have entered the country without legal documents will still be treated as criminals, to be expelled from the country as soon as they are discovered. The four million to five million covered by the executive order will become a federally regimented cheap labor force. Those who register with the DHS will gain only temporary security, subject to the decisions of the next president—or Obama himself if circumstances change in the next two years—in which case the DHS database will become an invaluable resource for the resumption of mass roundups, detentions and deportations. Obama hailed as a model the reactionary immigration bill passed last year by a bipartisan majority in the US Senate, while complaining that the Republican-controlled House of Representatives had refused to bring it to a vote. This bill placed its main emphasis on border security while establishing a draconian 17-year-long process through which some undocumented workers could gain citizenship. White House officials said that some provisions of the Senate bill, such as the citizenship process and special provisions for temporary agricultural workers, were beyond the president’s legal authority to enact in an executive order. The immigration measure was drafted under the rubric of “prosecutorial discretion,” in which the president, as chief executive, can decide to prioritize enforcement of immigration laws against particular categories of immigrants, given that the federal government lacks the resources to immediately round up 12 million people. Obama spent a considerable portion of his speech defining how narrow the executive order would be, including denying Medicaid, food stamps or other benefits to immigrants given work permits. “Mass amnesty” is, in fact, the only policy compatible with democratic principles. All workers should have the right to live in whatever country they choose with full citizenship rights. But under the capitalist system, capital is globally mobile while the working class is imprisoned within the borders of the nation-state. Obama’s claim that mass deportation is “contrary to our character” conceals a contradiction. Certainly, for the vast majority of working people, the police state measures that would be required to round up and deport 12 million people, ripping apart millions of families, would be abhorrent. (By one estimate, 13 percent of all school children in California and Texas have at least one undocumented parent). But for the US ruling elite, and for the Obama administration in particular, “rounding up millions” is perfectly conceivable. In its six years in office, the Obama administration has rounded up nearly three million immigrants already. Large sections of the Republican Party advocate detention and expulsion of millions more. The dispute between the parties, insofar as it exists, reflects divisions within the ruling elite over how politically explosive such an operation would be and how disruptive of the functioning of large sections of the US economy that depend on superexploited immigrant labor. Sections of the Republican Party, particularly those linked to the ultra-right Tea Party groups, have long used demagogic attacks on immigrants as a political weapon. Republican Senator Tom Coburn of Oklahoma suggested that any action by Obama perceived as pro-immigrant could touch off vigilante-style actions. Obama made repeated appeals to ultra-right sentiment in the course of his television speech, pleading with Republicans that disagreement over immigration should not prevent collaboration in other policy areas once they take full control of Congress in January. There is particular concern in Corporate America that the immigration issue could disrupt passage of a federal budget for the remainder of the current fiscal year, which began October 1. A continuing resolution to fund the government expires December 11, and House and Senate Republican leaders have been at pains to reassure Wall Street that there will be no repetition of the 2013 temporary shutdown of the government and no default on federal debt payments. The Los Angeles Times, in one of the few press commentaries that cut through the pretense of huge disagreements between the two parties, noted Thursday that “the strong reaction by Republican leaders has less to do with opposition to the nuts and bolts of the president’s immigration policy and more to do with fear and anger that the issue will derail the agenda of the new Republican majority before the next Congress even convenes.” This includes making deals with Obama over pro-business measures on taxes, trade and energy policy.